“Queen’s Park, probably the outstanding organisation in amateur sport in the countryresumed the function of sports promoters on Saturday after a lapse of nine years. This fact had aroused the keenest anticipation as to the quality of the fare, and possibly the high expectation accounted for the sense disappointment at the end of the proceedings. The various events failed in intensity, and as a whole, competition did not get beyond the commonplace. The heavy rain which fell midway through the meeting was no doubt influential in some degree in dulling the edge of interest, but when due allowance is made for this factor, there remains the impression of the need to discover some other cause which operated against the realisation of the expected standards. An examination of the programme discovered a great proportion of newcomers, concerning whom recent and reliable data for the estimation of capacity cannot have been available. To this may be attributed the lack of closeness in the majority of finishes. There were one or two notable exceptions, but on the whole the general remark made above is justified. Of course, as the season advances, data will accumulate, and the handicapper’s presently difficult task will be rendered less difficult. The above report appeared in the Glasgow Herald of June 9th, 1919 in the column ‘Notes on Sport’ welcoming the return of the event after the War. The actual report on the return of the Queen’s Park amateur sports, which appeared further through the paper, was shorter and told us that there were 7000 spectators. Events were 100 yards, 220 yards, half mile, Mile, Mile Invitation Relay, a schools relay race and a high jump – plus the almost obligatory five-a-=side which was won by Rangers (3 corners) from QPFC (2 corners). The sports were back. And Scotytish athletics were the better for it. “The meeting turned out to be quite successful, regarded from a sporting standpoint, while in respect of public attendance it was the best that the club has ever had, the crowd numbering not far short of 12,000. In the 100 yards handicap a considerable proportion of the competitors were long mark men with unfaniliar names, and in the final no back-marker found a place. 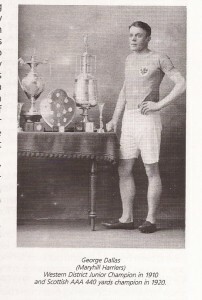 The Scottish champion, AH Goodwin, was absent owing to illness, and interest was largely centred on JB Bell who, from 2 yards, won his heat in easy fashion, and also got home first in the semi-final; but the final was won in faster time than he has shown, the winner doing 10 2-5th seconds from 7 yards. In the heats of the furlong, Bell was unable to touch 23 seconds for the full distance, and in the 440 yards he did not finish. Both the half-mile and the mile fell to Jas McFarlane of Maryhill Harriers from 25 and 35 yards respectively. The invitation relay race was deprived of some interest by the absence of the teams representing Glasgow and Edinburgh Universities, only Maryhill, West of Scotland and Edinburgh Northern Harriers taking part. The champions were easy winners, but it is quite possible that another result would have been seen if Glasgow Universityt had been able to raise a team, as in that case, JB Bell would have run against the winners rather than for them. WL Hunter, Edinburgh University, competed in the high and broad jumps and the hurdles. He was unable to concede ths starts given in the jumps, but he won the hurdle race with a fine sustained effort. Giving AG Deans 16 yards, he made ground steadily, and the pair cleared the last hurdle simultaneously, the ex-champion obtaining the verdict at the tape. It only remains to add that Celtic won the five-a-side, defeating Queen’s Park by two goals to nil. Probably the sports of the Queens Park Football Club will rank as the finest meeting of the season, not even excepting the Scottish Championships gathering in Edinburgh. Entries were large and included the champions at all distances, at the jumps and at the hurdles. It is true that they did not all compete in all the events for which they were entered, some reserving themselves for particular contests, such as the relay race, Edinburgh to Glasgow, but everyone made at least one appearance so that the proceedings were invested with an unusual interest from start to finish. Some disappointment was caused by the non-success of EH Liddell, the sprint champion, who failed to reproduce his usual form, but it is understood that he was suffering from a slight indisposition during the running of the open 100 yards handicap and the invitation sprint, and was unable to do himself justice. 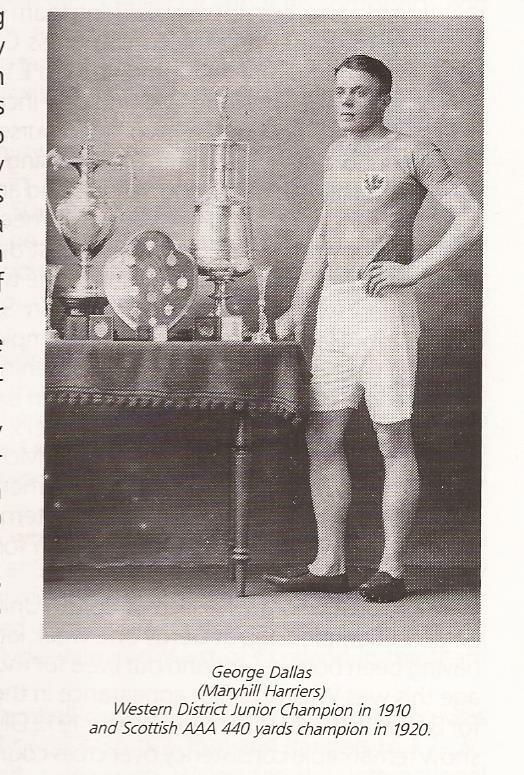 Of the names mentioned, Liddell and McPhee are still well-known but CB Mein was a winner of medals of every colour at the SAAA Championships through the 1920’s and very good 880 yards specialist. Also running in the meeting was George Dallas who this year ran a 220 yards stage for the winning Glasgow team in the relay. Unfortunately this time the crowd was not nearly as good, being estimated at about 4000, due at least in part to poor weather at the start of the day discouraging the potential spectators from venturing out. In 1923 it all came together – brilliant sunshine, six national champions and a crowd of 12,000. ” …. The six Scottish champions who took part were accompanied by most of the prominent athletes in the east and the west , but possibly the most pleasing feature of all was the presence in the field of runners who have hitherto shown little interest in participation in open meetings. Two of those newcomers distinguished themselves on Saturday. 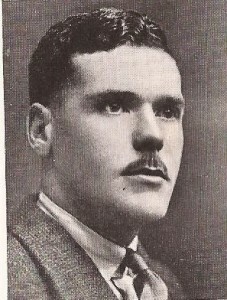 R McLean, the Glasgow High rugby footballer, running off the five and a half yards mark in the open hundred and nine yards in the furlong, captured both events in such excellent style as to suggest that were he to take to the track seriously he would prove a strong opponent for those in the first flight. His success was no surprise to those who have watched his running this season in inter-club relay races, and it would be interesting to see him opposed to Liddell and McColl over the quarter mile. The other newcomer who impressed was CD McTaggart, of Watson’s College, who established a new school record for the mile a month ago. Although he was competing in a field, the dimensions of which must have been disconcerting to his experience, his performance in running into fourth place, 15 yards behind J Dickson, the winner, whose time was 4 min 25 4-5th sec, was a creditable one. Despite fine weather, a ‘good attendance’ and Olympic trials at 100, 400 and 800 metres, the Sports on 7th June 1924 were said to be a disappointment. How so? “With the Scottish championships due on Saturday next, it cannot be claimed that the Olympic trials over the 100, 400 and 800 metres which were introduced by Queen’s Park Football Club into the programme for their annual sports meeting at Hampden Park, served any useful purpose. In the absence of such prominent runners as EH Liddell, WR Milligan, EB Mein, AR Valentine and Duncan McPhee, they shed no new light on the problems faced by the selectors. It can however be said that both the 100 and 800 metres provided excellent finishes. In the sprint, AF Clarke snatched the victory from R McLean by a matter of inches, with J Crawford of Queen’s Park, just at the old High School boy’s shoulder. The finish in the distance event was equally close, half a yard separating WH Calderwood, JD Hope and JR McIntyre, the trio finishing in the order named. The 400 running event was almost a fiasco, only two of the ten runners invited turning out, and D McRae of Maryhill Harriers created a surprise by defeating his team mate AH Graham by three yards. The final comments on the mile medley relay are interesting because they indicate the running order of (2 x 220) + (1 x 440) + (1 x 880). Most reports of the mile medley comment on the result of the ‘opening half mile’ and there are some others that list the order as (1 x 440) + (2 x 220) + (1 x 880). The race eventually settled to running the half mile first, then the two furlongs and finally the quarter mile whereas south of the Border the running order was usually the other way round with the quarter first and the half last. With no Olympics in 1925, the meeting stood on its own two feet and was a magnificent success: all the top talent was there – CB Mein, Eric Liddell, WH Calderwood, Dunky Wright, Tom Riddell, Donald McLean, JG McIntyre, AF Clarke – with a crowd of 10,000 and good weather as well. The Queen’s Park Football Club’s annual meeting at Hampden Park on Saturday will rank as one of the most successful run by the club. For the first time this season we had brilliant sunshine and an absence of wind, the ideal conditions that make for good performances, and as a result the times recorded in the various events were much in front of anything we have had so far. The chief attraction for the 10,000 supporters lay in the presence of EH Liddell, and although the champion did not win the special quarter mile, he ran well enough, both in this event and also in the relay race, to suggest that he is approaching his true form. He was unofficially clocked as recording 50 1-5th sec in the quarter mile, and as he slowed down a little on approaching the tape, he may be taken as travelling a yard or two faster than that time. He appeared to be moving very much more freely in the quarter of the relay race, and defeated McCrae, the half mile champion, very easily over the distance. RA Robb, of Glasgow University, and JD Hope, the West of Scotland harrier, fought a very keen race for first place in the special quarter, and it was only in the last few strides that Robb got up to winin the excellent time of 49 4-5th sec. The effect of Liddell’s running for the Edinburgh team in the relay race was reflected in the time returned, 3 min 39 4-5th sec – this being 1-5th better than the previous best over the distance, recorded by the Edinburgh University quartette in 1922. Glasgow’s chance was hopeless here from the completion of the first section, as CB Mein defeated RB McIntyre by three yards and FB Wardlaw and AF Clarke gave so little away in the two furlongs that McCrae, Glasgow’s fourth man, was asked to concede a yard to Liddell when the final quarter was entered upon. McIntyre’s failure was unexpected in view of his recent good form, but he had run previously in the invitation half which he won in comparatively slow time, and apparently this effort had taken too much out of him. At least Mein had no difficulty in shaking off his challenge when the pair settled down to race. The five who turned out in the special half mile included McCrae but he is evidently not quite fit, as he eased up in the finishing straight. The open half mile was won by JG Sloss of West Kilbride, off 80 yards, and the time, 1 min 56 sec, indicates that he has made great progress. Possessing a good style, he should go further. Off the 106 mark, J Dickson, Glasgow Harriers, captured the mile. The team race was won by Shettleston (1, 5, 12) 18 pts: 2. Edinburgh Southern Harriers (4, 7, 11) 22 pts.